Industrial robots are driving improvements in productivity, quality, and flexibility that are helping U.S. manufacturers to compete globally. At the same time, they’re spurring the growth of a new ecosystem of jobs, from mechanical design to AI-based computer vision. 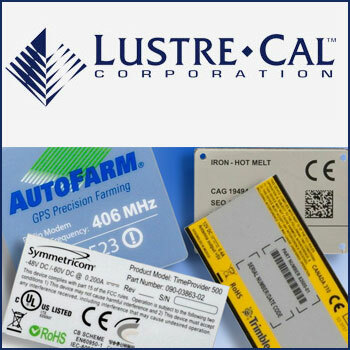 Quality Manufacturing Services, Inc. (QMS), a provider of electronics manufacturing services in Lake Mary, Florida, has invested heavily in high-speed surface mount pick-and-place equipment, a key contributor to quality as electronic components and packages continue to shrink in size. Photo courtesy of Quality Manufacturing Services. The robots are coming—that much is true. But manufacturers, by and large, don’t see them as the job-stealing invaders of the workplace that many people have imagined. It’s not that robots don’t excel in performing many tasks formerly done by people. It’s just that people also excel in certain areas where robots aren’t up to the task. And in the manufacturing realm, industry leaders and company officials who have integrated robots into their plant’s operations say that their impact stretches well beyond the work that they’ve proven to do so well. In manufacturing, people can focus on higher-level work because industrial robots are known to perform repetitive tasks with greater precision than their human counterparts. Manufacturers who use robotics in printed circuit board assembly, for example, often report greater peace of mind knowing that the robots are maintaining high quality while increasing the productivity of their operations. Sam Hanna, president of Quality Manufacturing Services, Inc. (QMS), a provider of electronics manufacturing services in Lake Mary, Florida, said that QMS has added robotics to its operation when a reasonable return on investment has justified the investment. 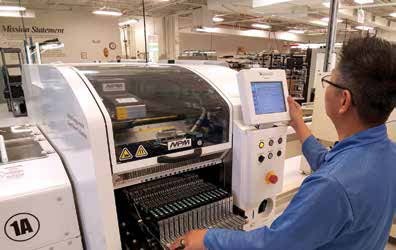 The company has invested heavily in late-model surface mount pick-and-place equipment, a key contributor to quality as electronic components and packages continue to shrink in size. Grand View Research, Inc., a U.S.-based market research firm, released a report in June that forecast the size of the global industrial robotics market to reach $41.23 billion by 2020. The firm anticipates the market to grow at a 7 percent compound annual growth rate through the forecast period, fueled largely by rapid expansion of the automotive industry worldwide and rising adoption of robotics in non-automotive segments, such as plastics, rubber, and electronics. The Asia Pacific region is showing the strongest growth, accounting for more than 52 percent of revenues in 2017, the firm said on its website. Grand View Research also noted that industrial robots have spurred the development of a new ecosystem that offers lucrative, rewarding, and high-paying jobs. While venture capitalists have shown that they are willing to fund companies that design and manufacture industrial robots, advancements in artificial intelligence and the development of sophisticated sensors are expected to augment the development of self-programming robots, the firm said. Brian Ray, president and CEO of Ray Products Co., Inc., an Ontario, Calif.-based manufacturer of custom thermoformed plastic parts and enclosures, said that automation has “a huge grip on manufacturing in North America.” Ray sees automation as a difference maker for smaller companies like his own—job shops that build parts to customer specifications and aren’t running a million parts at a time. “It’s a game changer for companies that are build-to-print,” he said. For companies like Ray Products, their smaller production runs—ranging from hundreds to thousands of parts—mean that they need to change machine setups more frequently to accommodate their next project. Robotic trimmers enable Ray Products to make the transition from one job to another quickly, without sacrificing part quality. Ray Products’ robotic trimmer uses a 5-axis robotic arm, attached to a base. The trimmers enable the company to make the transition from one job to another quickly, without sacrificing part quality. Photo courtesy of Ray Products. 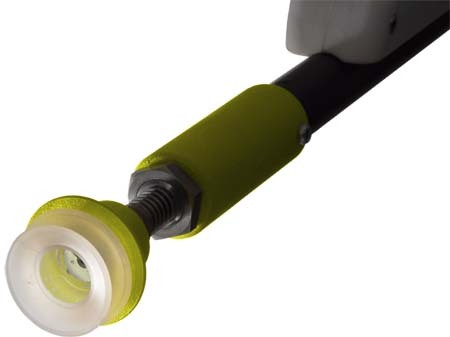 Ray Products’ robotic trimmer uses a 5-axis robotic arm, attached to a base. The part is loaded onto a table that positions the part for processing and is capable of rotating 360 degrees. The robotic arm maneuvers to the area of the part that requires processing, where it performs whatever secondary operation is required, whether it’s trimming, routing, or cutting. Ray said he doesn’t look at robots as a replacement for people. Nor does he view management decisions about them as a choice of one or the other. “We’ve never had to make that choice, and we won’t make that choice—they go together.” To him, people and robots go hand in hand. “If you’re growing your business and you’re doing more things for more customers that require more capacity, you add capacity by adding equipment, and then you have to have people to run that equipment,” he said. Before Ray brought his first robot into the plant, he worked to allay any fears his team might have by explaining why the company was introducing a new technology. He also solicited their thoughts and feedback. Initially intended to be used solely for new business, the robot quickly proved its worth, exceeding all expectations. The idea was to keep the company’s legacy, gantry-based machines operating and see how the robot fared. Within about seven to 10 working days, Ray said, the answer became obvious. Today, the company operates five robotic trimmers. Ray said his employees are excited about the robots because they see them as tools that enable Ray Products to be ultra-competitive. The programming and some of the nuances that came with the robots and automation were a little bit of a learning curve, like any new software is, Ray said. But it wasn’t as drastic as he envisioned it. Harry Moser, president and founder of the Reshoring Initiative, an organization dedicated to bringing manufacturing jobs back to the United States, described the impact he believes robotics will have on U.S. manufacturing by using the Latin phrase, sine qua non—“without which [there is], nothing.” He said the greater risk lies in not automating. 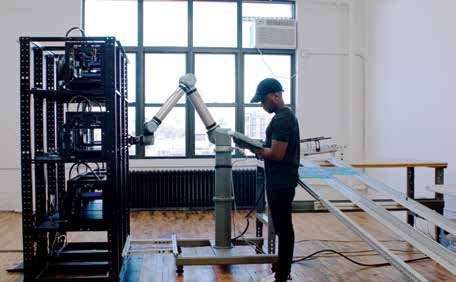 A Voodoo Manufacturing team member works alongside a Universal Robots UR10 collaborative robotic arm at Voodoo’s factory in Brooklyn, N.Y. Voodoo is a 3D printing startup focused on delivering on-demand manufacturing through the integration of software, 3D printers, and robotics. Photo courtesy of Universal Robots and Voodoo Manufacturing. How important is robotics technology to the future of U.S. manufacturing? One indication is the work being done at Sandia National Laboratories, a Federally Funded Research and Development Center (FFRDC) that undertakes projects important to national security (see At Sandia, Robotic Testing Goes Hand-in-Hand with Materials Development). Sandia engineers have designed and built a six-sided work cell that uses a commercial robot to perform rapid, automated part testing. Dubbed Alinstante (Spanish for “in an instant”), the flexible, modular, and scalable robotic system is designed to accelerate the process of qualification and testing. Sandia is interested in teaming with industry partners to help expand or discover more uses for the robotic testing system. Given the extent to which manufacturing companies are already using robots in a variety of operations, there would appear to be no shortage of potential partners. Today, robots perform tasks ranging from honing to packaging, machine tending, and part inspection. At Spirit AeroSystems in Wichita, Kansas, robots reduce the time required for inspection by automatically inspecting complex aerospace parts up to 200 feet long, including fuselages, wings, and substructures. The company’s engineers are also looking into other possible uses, such as machining, sealing, and material handling. 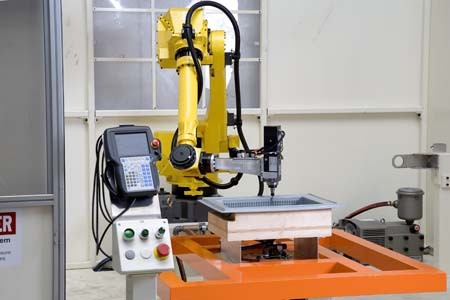 Meanwhile, Fitzpatrick Manufacturing, a CNC machine shop in Sterling Heights, Michigan, is using Sawyer™, a one-armed collaborative robot from Rethink Robotics, to boost operational efficiency. The robot loads parts into a honing machine and then places them into a wash station. Jonathan Schwartz, co-founder of Voodoo Manufacturing, a robotic 3D printing startup based in Brooklyn, New York, told D2P that Voodoo is working to develop vision technology that will enable its robots to effectively tend a greater number of printers. He sees robotics as key to not only Voodoo’s business model, but to the health of American manufacturing in general. Robots have been used in factories for decades, typically operating as fixed-mounted machines with perimeter guarding, or safety fencing, to protect humans from their swift and powerful movements. Although these robots—particularly those being used in the automotive industry—don’t appear to be going anywhere soon, they’re no longer the only game in town. Nowadays, it’s becoming more common to see mobile industrial robots moving freely about the factory floor, working safely with people in a supportive, collaborative role. Examples include mobile manipulation robots, which feature a robotic arm mounted on a mobile platform, or automated guided vehicle (AGV). These sophisticated machines reflect a longstanding dream of product developers to combine the dexterity of a robotic manipulator arm with the mobility of an AGV. “This is really a holy-grail area for robotics—not just getting robots to navigate from point A to point B but getting robots to do something useful at point B, autonomously,” said IAM Robotics’ Tom Galluzzo, in his presentation at MIT Technology Review’s EmTech Next. The road to fulfilling the dream hasn’t been easy. IAM Robotics’ Swift™ robot uses 3D computer vision and AI technologies to execute tasks. The robot is capable of driving around factory and warehouse floors, navigating, finding, and transferring items from shelves to shipping. IAM Robotics has developed computer vision algorithms using embedded GPUs (graphical processing units) that enable the machine to perceive items in real time in 3D. Photo courtesy of IAM Robotics. Galluzzo believes that IAM Robotics, a Pittsburgh-based developer of autonomous material handling systems for use in supply chain (order fulfillment) and manufacturing facilities, is on track toward solving that problem. The company, which Galluzzo co-founded in 2012 with Vladimir Altman, IAM’s vice president of engineering, has developed an integrated system that uses a 3D scanner and powerful software interface in tandem with a mobile robotic arm to efficiently find, pick, and transport items from warehouse shelves. During his presentation, Galluzzo zeroed in on what differentiates IAM Robotics’ technology from what’s been used in other robots. He said IAM Robotics’ Swift™ robot is “a world’s first” because “it’s using computer vision and AI technologies to drive around, navigate, and find and pick items.” IAM Robotics has developed computer vision algorithms using embedded GPUs (graphical processing units) that enable the machine to perceive items in real time in 3D, he said. “We’re pushing the envelope of what’s possible with mobile manipulation robots,” Galluzzo told D2P. IAM’s robots use 3D computer vision to execute tasks. They don’t just use cameras; they use 3D depth cameras to navigate their way around the facility and find the items they’re looking for. “They’re able to identify parts and objects with those depth cameras and figure out ‘Is this the right part? Is it a different part?’ And then they figure out where to grasp it and pick it up,” Galluzzo said. 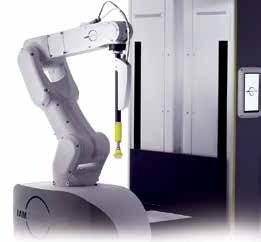 IAM Robotics’ Swift™ robot consists of a mobile base, a lift, and a robotic arm. The lift sits atop the mobile base and includes a carriage that supports the robot arm. Different types of end effectors, including suction cups, can be applied to the robot arm to handle different types of projects. The Swift robot is integrated with Flash™, a 3D scanner that records product dimensions, weight, and imagery; and SwiftLink™, a software interface and control system through which customers manage their fleet of Swift robots. SwiftLink software integrates with a customer’s existing warehouse management system or facility management system, and issues commands to the robots for setup and picking. When data from the customer’s warehouse management system enters SwiftLink, Galluzzo said, SwiftLink marries that data with additional data needed by the robots to map information and perform tasks. The data is then sent to the robots in the form of commands to go to specific locations to pick and transport inventory. As it monitors robot status and tracks productivity, the software communicates order and task status back to the warehouse management system. The Flash 3D product scanner is a compact, mobile device that is reported to record the barcode, 3D dimensions, weight, and a high-resolution image of a customer’s product in less than a second. The information that it collects is used to teach a customer’s robots how to find a specific product on a shelf. Besides being used by the Swift Product Suite for picking operations, the data can be used by the customer to support inventory management, packing, stocking, and the generation of planograms. IAM’s robots are currently being used to perform supply chain tasks in order fulfillment distribution centers. Galluzzo said the company is exiting the pilot phase with some of its customers and progressing toward scaling up and adding more robots. “Some of our customers are using the robots for some novel applications, so they’re still in the pilot phase,” he said. The company’s first customer is Rochester Drug Cooperative, a healthcare distributor that serves independent pharmacists throughout the Northeast. When people order products online, the robot uses its computer vision to drive to the right location in the distribution center, locate the items, grasp them, and transport them to the area where they’ll be prepared for shipment. The Swift robot from IAM Robotics uses different end effectors, including suction cups, to pick and move items. Photo courtesy of IAM Robotics. Their ability to perform these tasks makes them well-suited for similar types of work in manufacturing, like picking up parts from a production line or moving boxes of parts from one location to another. Galluzzo and his team have talked with numerous manufacturers about new applications for IAM’s mobile manipulation robots, and they see a wealth of potential uses for them in factories. Where manufacturers use multiple work cells, for example, the robots could move parts from cell to cell so that different steps in the manufacturing process can be applied. When the processes are complete, the robots could place the parts in batches on a tray and move the trays over to the next step in the process. They can also do mobile machine tending. Galluzzo said the data collected by the robots in the field is used for machine learning, which allows improved algorithms to be fed back to the robots so that they can perform their jobs better. If necessary, higher levels of decision making can be made via the cloud. For example, a person working within 10 feet of the robot may be using a mobile app to guide the robot to make the right decision when it’s uncertain about which item to pick next. But if that person becomes unavailable to guide the robot, or a higher-level failure occurs, information about the situation can go in real time to the cloud. Although encouraging, the wide scope of new applications presents real challenges for both IAM Robotics and industry in general. Manufacturing applications are extremely broad and, in many cases, represent uncharted territory for mobile manipulation robots. Different processes involve handling different types of materials, parts with varying sizes and features, and multiple types of trays, bins, and other containers. Using mobile manipulation robots for manufacturing requires top-notch software, as well as skilled third-party integrators who can help manufacturers work them into their operations. Integration figures to be a key area for the company going forward, one where Galluzzo anticipates substantial demand for hiring new employees. Most of IAM’s employees have advanced degrees in specialty areas of robotics, from mechanical design to computer vision. Galluzzo expects the company will continue to bring in more engineers with expertise in robotics, computer vision, and software in general. Another challenge for the company lies in pulling together the multiple engineering capabilities needed to bring a leading-edge autonomous robot to market. Always a feat that requires deft coordination, it is inherently more difficult when attempting to deploy technology in ways not seen previously. Galluzzo, who holds a Ph.D. in robotics from the University of Florida and a bachelor’s in aerospace engineering from Embry Riddle Aeronautical University, recently named Joel Reed, formerly the company’s vice president, as IAM Robotics’ new chief executive officer. Reed’s accomplishments include establishing the market presence for a new class of autonomous AGVs at Seegrid, a developer of self-driving vehicles for material handling. The move also enables Galluzzo to concentrate on his areas of expertise. Galluzzo acknowledges that for many companies, particularly in supply chain, it’s difficult to invest the capital to automate. But an ongoing labor shortage, coupled with the digital transformation of commerce and industry that is widely expected to accelerate, are factors working in IAM Robotics’ favor. What does Galluzzo say to people who have concerns about robots displacing workers? Galluzzo emphasized that as companies invest capital in robots and realize significant savings from them, it’s essential that they reinvest those savings into educating their employees to do higher level jobs. What Does ‘American Made’ Mean to You?